13 Events to Remember in 2013! 1. 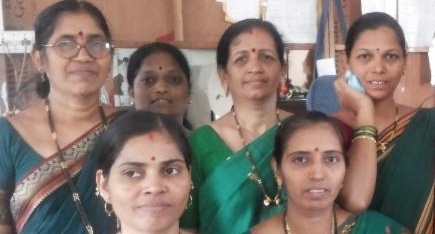 MarketPlace in Mumbai inaugurated a training cell as many women are approaching us for jobs. Although a number of community development organizations in the slums conduct sewing classes for women, they are not teaching the women how to sew efficiently and earn a good living. In contrast, this training cell is giving them the skills to become self-sufficient. 8 women were trained in 2013 and are now working with different cooperatives. 2. In September we held a two day meeting bringing together the fabric suppliers and the artisan groups. Normally the groups that make the fabric come to Mumbai twice a year to discuss design, colors, production and delivery. Fabric supply is always a challenge. At this meeting, we had the opportunity to hold brainstorming sessions to discuss various problems and work out solutions for them. 3. Our Armaan Club kids reached the semi-finals of a city-wide soccer tournament! The Armaan Club, consisting of daughters and sons of the artisans, played games every Saturday under a program conducted by Magic Bus, a non-profit organization working with children to inculcate values, discipline and confidence. 4. 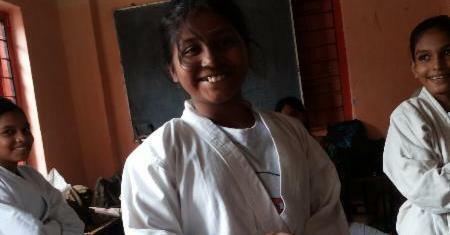 The young girls and boys of the Armaan Club started Karate Classes every Saturday morning. Because there is so much violence in the city, particularly against women, we felt that this was an important lesson. 5. The Armaan Club kids went on a one-day picnic to an amusement park and had the time of their lives!! They do not normally have the opportunity to visit such places and it was so wonderful to see them take advantage of almost every ride. 6. The Pushpanjali Collective decided to celebrate Navratri, a nine-day Hindu holiday, together. The women artisans see their cooperative as their family and have many group events such as going for picnics, celebrating festivals, etc. For their Navratri celebration, the Pushpanjali artisans decided to chose a color for each day. Green was the color of the day here. 7. Artisans’ Day is so popular it is now celebrated twice a year! Preparations go on for weeks and the entire event is organized by the women themselves. On the big day(s), each group enacts a skit, sings a song or does a dance. 8. In March, 2013, Indira Johnson, a renowned artist from Chicago, worked with the women on a project entitled “I can’t; Yes, I can!” She and the women explored and discussed things that women in India have been told from childhood that they cannot do and then talked about things they were doing despite tradition. After the discussion they made flags representing overcoming these obstacles and marched through the streets. 9. The artisans took part in a city-wide social action protesting the corrupt ration system. Rationing was established in Mumbai in 1968 with the purpose of providing essential commodities to needy residents at reduced rates. Unfortunately, the system has become very corrupt and the Ration Shop owners are instead selling the wheat to profit-making companies like liquor breweries, an act which is not only selfish but illegal. 10. The MarketPlace and SHARE staff and managers of the cooperatives were treated to a one-day picnic at a water park. Water parks have become big recreation destinations in Mumbai but are a bit expensive. The package included breakfast, lunch and snacks all day.It was such a great bonding experience and everyone stayed until the very last minute – until the park closed down! 11. Kirit Dave visited the United States. Kirit is a well known designer who has worked with MarketPlace since the beginning. He visited the New York NOW trade show, SERRV International, and also met with customers and the member of theMarketPlace Board. 12. Kala Darji, the Merchandizing Manager in Mumbai, came to Boston to visit her brother and his new baby. We took this opportunity to invite her to Chicago. Unfortunately it was November and when all of us were saying the weather was so nice at 45 degrees, she was freezing to death! 13. In May, Pushpika Freitas represented MarketPlace at The World Fair Trade Conference in Brazil. This is a bi-annual event and an opportunity for producer groups and marketing organization to discuss the challenges of Fair Trade and express visions for the future. Previous Post: See MarketPlace Clothing Styled in Unique Ways! Next Post: Rock a Tunic from MarketPlace!